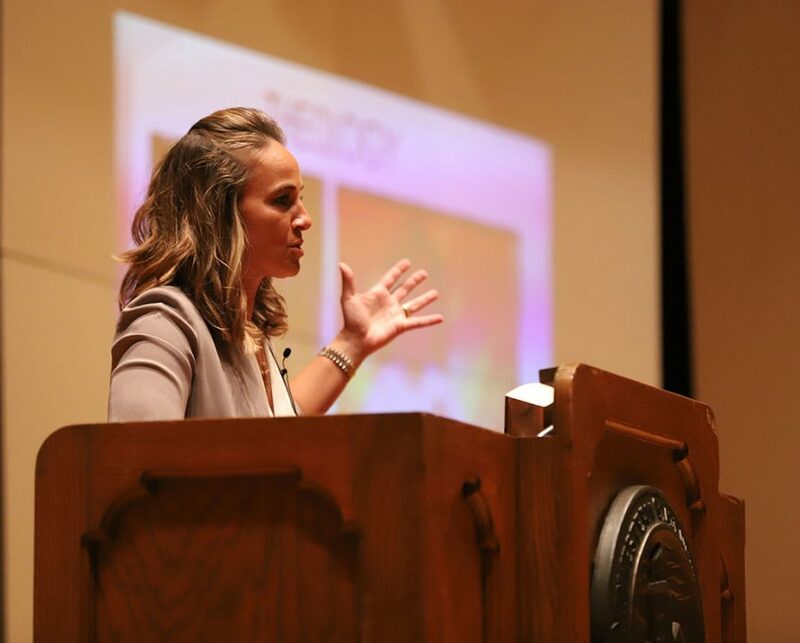 Becky Hammon, San Antonio Spurs assistant coach, speaks of her basketball story during the Artist Lecture Series Event at Akin Auditorim on Thursday Sep. 6, 2018. A woman in a beige blazer approaches the podium in Akin Auditorium. She knows what it’s like to be overlooked when you’ve tried your best, traveling far away from home, and to have your love for your country scrutinized. Yet, she knows you grow as person through those hard times. Hammon continued, telling the audience how she worked hard to become assistant coach. “I was about impacting and giving back to my communities. These were just little opportunities that came up. I had no idea anybody was watching. Those days like I said turned into weeks, turned into years and pretty soon you’ve built something special,” Hammon said. About 200 guests attended the opening artist lecture series on Sept. 6. 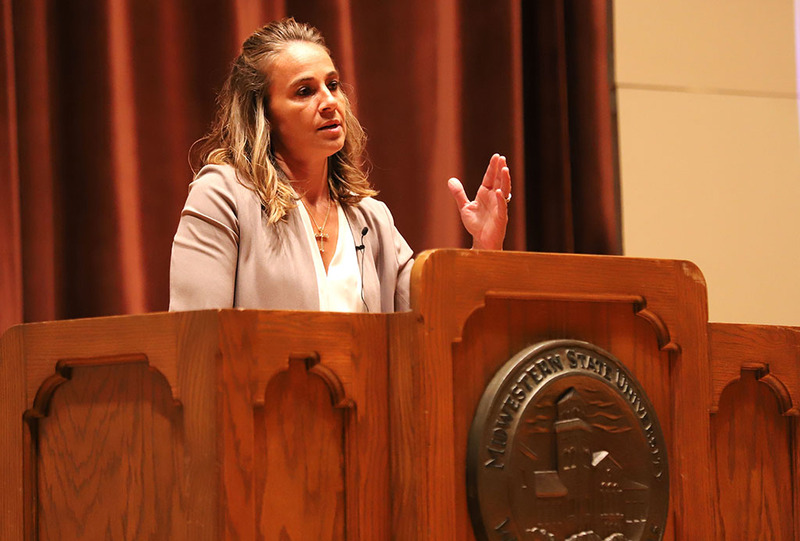 Hammon, who has been a part of a similar lecture series in the past, and enjoyed it, said she has always liked speaking to a younger generation. She wants them to take something home from her series and apply it to their daily life. When asked about how to influence young girls who are interested in possibly becoming an assistant coach or interested in basketball in general, Hammon says to follow your passions. “You’re always in a constant state of learning so, you can never learn enough but also I would also just say, showing up goes a long way because a lot of times people don’t even ask if they can become involved,” Hammon said. “right now, things that are going on in our society, doors are starting to open more so we need more women knocking on those doors and asking the questions and trying to get those opportunities. Hammon also discussed why she chose to become an athlete, saying it was her first love. “I spent the most time playing basketball and it’s taken me all over the world and as you know every athlete has a shelf life right? Father time catches us all eventually so, I had to start thinking what I had wanted to do after.” Hammon said. “Coaching seemed like a natural fit because I was always kind of the coach, coach extension when I was out of the floor,” Hammon said. Avery Queen, biology senior, a fan, athlete and female basketball player, wanted to learn about what it takes it be a successful female in the men’s athletic world. “I’m a fan of Becky and when I saw that she was gonna be here I knew I had to come,” Queen said. Another fan said she was one of the best WNBA players in the entire world.